Trenton Jamond "Trent" Richardson (born July 10, 1991) is an American football running back who is currently a free agent. He played college football for the University of Alabama, was recognized as an All-American, and was a member of two BCS National Championship teams. Considered the top running back prospect for the 2012 NFL Draft, Richardson was considered by some as the best running back prospect since Adrian Peterson, and was selected third overall by the Cleveland Browns. Richardson was frequently compared to Emmitt Smith, who also starred at Escambia (1987 graduate), but his physique and running style are more similar to Earl Campbell. Richardson also drew comparisons to Michael Turner and O.J. Simpson. Considered a five-star recruit by Rivals.com, Richardson was listed as the No. 2 running back prospect in the nation (behind only Bryce Brown). He chose Alabama over Florida, Florida State, and LSU, among others. "Alabama Football Commitments". Rivals.com. Retrieved 2011-12-13. "2009 Alabama Football Commits". Scout.com. Retrieved 2011-12-13. "Scout.com Team Recruiting Rankings". Scout.com. Retrieved 2011-12-13. "2009 Team Ranking". Rivals.com. Retrieved 2011-12-13. Richardson was named SEC Freshman of the Week for Week 2 and Week 4. Richardson was also named to the 2009 SEC All-Freshman team alongside Barrett Jones and Nico Johnson. He also contributed significantly in the 2010 BCS National Championship with 109 yards rushing and 2 touchdowns. For the season he had 145 carries for 751 yards rushing and 8 touchdowns. He also had 126 yards receiving on the season. Richardson started the first two games of the season with Mark Ingram sitting out due to an injury. In the season opener, he had 10 carries for 66 yards and 2 touchdowns. He also had 3 receptions for 46 yards. The following week against Penn State, he ran for a career-high 144 yards on 22 carries and a touchdown. He also had 4 catches for 46 yards. Trent was named Co-SEC Offensive Player of the Week for his efforts. For the season he had 112 carries for 700 yards rushing and 6 touchdowns and 266 yards receiving and 4 touchdowns. Richardson also had 634 kick return yards with a touchdown on the year. With the departure of Mark Ingram to the NFL, Richardson took over the starting role at running back. During the season Richardson ran for over 100 yards in nine games. He tied Shaun Alexander with six consecutive 100-yard rushing games. He scored two or more touchdowns in seven games. He set a career high against Ole Miss running for 183 yards and four touchdowns. In the Iron Bowl, Richardson ran for a new career high of 203 yards. He won the Doak Walker Award becoming the first player from Alabama to win. He finished third in the Heisman Trophy voting behind eventual winner Robert Griffin III and Andrew Luck. In the 2012 BCS National Championship Game, Richardson rushed for 96 yards and a touchdown to secure his second national championship with the Crimson Tide. For the season Richardson had 1,679 rushing yards, breaking Mark Ingram's record for most rushing yards in a season, and 21 rushing touchdowns. His 21 rushing touchdowns was also an SEC running back record. He also had 338 receiving yards with three touchdowns, making his season total touchdowns 24 which tied Shaun Alexander's SEC record. 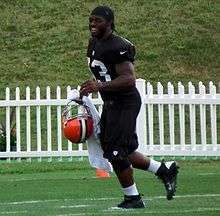 On January 12, 2012, Richardson declared for the 2012 NFL Draft, thus forgoing his final year of collegiate eligibility. At the time of his announcement, he was projected as a first round pick and the top running back prospect in the draft. Entering his junior season, Richardson was widely regarded as the best running back available in the 2012 NFL Draft, and he cemented his reputation with strong play over the course of the year. After undergoing a minor knee surgery in February 2012, Richardson did not participate in drills at the 2012 NFL Combine. He later also decided to skip workouts at the Alabama Pro Day on March 7. Richardson held his own Pro Day on March 27. By March 2012, Richardson was widely projected to be a top six draft choice, with the Cleveland Browns, Tampa Bay Buccaneers, and St. Louis Rams rumored to be most interested in selecting him. Former Colts vice chairman Bill Polian called him one of the "three sure-thing players" in the 2012 draft. Richardson was eventually selected third overall by the Cleveland Browns, after they had traded picks with the Minnesota Vikings to select him ahead of the Tampa Bay Buccaneers. Richardson was the highest selected running back since Reggie Bush went second overall in 2006. The Browns had not selected a running back in the first round since William Green in 2002. On July 23, Richardson and the Cleveland Browns agreed to a four-year, $20.4 million contract (fully guaranteed) with a $13.3 million signing bonus. On August 9, 2012, Richardson underwent arthroscopic surgery to remove some cartilage fragments in his left knee. Richardson missed the entire preseason, but returned for the season opener. In his debut against the Philadelphia Eagles, he rushed for 39 yards on 19 carries, being limited in his touches after having just come off the disabled list. The following week, in a 24-34 loss against the Cincinnati Bengals, he rushed for 109 yards and a touchdown on 19 carries. He also had 4 receptions for 36 yards and a receiving touchdown. He was the first Browns rookie to rush for over 100 yards and score rushing and receiving touchdowns, all in the same game. During Week 13, against the Kansas City Chiefs, Richardson rushed for 42 yards and 2 touchdowns, tying Jim Brown's franchise rookie record of 9 touchdowns. Prior to the 2013 season, Richardson was voted No. 71 out of the top 100 in the NFL by fellow players. Richardson would only play 2 games for the Browns in 2013. He rushed for 105 yards on 31 carries. On September 18, 2013, Richardson was traded to the Indianapolis Colts for a 2014 first-round draft pick. The Colts were looking for a running back after a season-ending injury to Vick Ballard. In his first carry as a Colt, Richardson scored a touchdown against the San Francisco 49ers. He struggled through most of the season and was demoted in favor of Donald Brown on December 1, 2013. Richardson returned to his starting role in the Colts week 15 game against the Houston Texans when Brown left due to injury, and recorded his first touchdown since week 4 against Jacksonville. Richardson fumbled on his first career playoff carry against the Kansas City Chiefs in the Colts' Wild Card game. Richardson began the season splitting carries with running back Ahmad Bradshaw, limiting his carries and yardage totals. Bradshaw was injured in a Week 11 game against the New England Patriots, making Richardson the lead back. However, after Week 13, Dan Herron replaced Richardson as the Colts' primary running back after totaling 88 yards on just eight carries, including a 49-yard touchdown run. In the 2014–15 NFL playoffs, Richardson was not active for Indianapolis' final two playoff games. He was suspended by the team for the AFC Championship Game after he missed walkthrough for what he called a "family emergency" and did not alert the team. On March 12, 2015, the Colts waived Richardson. On March 17, 2015, Richardson signed a two-year, $3,850,000 contract with the Oakland Raiders. The deal included $600,000 guaranteed. He missed the first part of training camp due to a bout with pneumonia. On August 31, 2015, Richardson was released. On April 18, 2016, Richardson signed with the Baltimore Ravens, but was waived on August 2, 2016. Richardson has two daughters: Taliyah and Elevera. Richardson's first son was born October 5, 2012. On April 13, 2012, he took leukemia survivor Courtney Alvis to her senior prom at Hueytown High School. ↑ "Richardson ready to break RB trend". Chicago Tribune. April 5, 2012. 1 2 3 University of Alabama Department of Intercollegiate Athletics. "2011–12 Overall Individual Statistics". RollTide.com. Retrieved October 1, 2011. ↑ "Is RB Richardson the smart pick at No. 5?". Tampa Bay Online. March 7, 2012. ↑ Sessler, Marc. "Baltimore Ravens sign Trent Richardson". NFL.com. Retrieved 18 April 2016.